Home › Anti-aging Support › Can Natural Solutions Give You Thicker, Fuller Hair? Although most people know that the volume of hair on one’s head is not the most important aspect of life, even mild to moderate hair loss can negatively impact self-esteem. Noticing a few strands of hair in your brush or sink is very normal throughout life, but losing clumps of hair can be distressing. Although traditionally thought to affect only men, many women experience hair loss as well. What causes hair loss anyway? Just like with a garden, hair grows (or doesn’t) depending on what is going on “under the surface.” Plants need good nutrients and a little love to grow strong roots and be healthy; so do hair follicles. Many gardeners choose to use natural products to help plants thrive rather than chemicals. Is there a way to similarly address hair loss naturally without resorting to artificial (and potentially harmful) substances? There are a number of natural answers for hair loss, depending on the cause. Each works better for some people than others and serve as gentle ways to help people boost hair volume, keep the hair they have, and possibly even regrow lost hair. Have you ever heard someone say that something makes them want to “pull their hair out?” Under extreme stress, as much as 90% of the hair in the growing phase can shift all at once to the shedding phase. About 6 weeks to 3 months after a stressful event is usually when this shedding occurs and it is possible to lose handfuls of hair at once under such a condition. Hair will often grow back as long as severely stressful events can be avoided. But for some women, this is a mysterious chronic disorder that can persist for months without any true understanding of the triggering stressors. The more obvious stressors that affect hair growth are events like child birth, malnutrition, severe infection, or major surgery. There is a substance, called dihydrotestosterone (DHT), which is a root cause (pun intended) of hair loss in both men and women. DHT is a by-product of the hormone testosterone; which is usually abundant in men but also found in women and girls to a lesser degree. Unfortunately, with the help of an enzyme found in the hair’s oil glands, testosterone changes to DHT. DHT literally shrinks the hair follicles and makes them finer and finer over time. Teenage girls may experience this kind of hair loss until their hormones balance out. Pregnancy also has the effect of changing a woman’s hormones as does ovarian cysts and menopause. Birth control pills are also known for causing hair to thin. In fact, some doctors actually prescribe birth control pills to teen girls who have excessive hair growth on their bodies during this time of their lives. Imbalances in the hormones that the thyroid produces can also contribute to hair loss. Besides birth control medications that affect a women’s hormones, other medications can cause hair loss. Such medications include anticoagulants, beta blockers, various hormones, anti-depressants and even high doses of vitamin A. Tight hairstyles like high ponytails, braiding, cornrows, tight buns and extensions all tug at the hair. If the condition is detected early enough, hair loss due to this cause will generally re-grow once the hairstyle is discontinued. Poor nutrition is the hair loss cause that is actually one of the most understood. With a poor diet, the body tries to conserve what few healthful nutrients it has and diminishes the amount of nutrients that go to the hair. This results in gradual thinning. And just as the thinning occurs gradually, it takes a well-balanced nutrition plan months to reverse hair loss that took months to make itself apparent. How do I know if I have hair loss? Female pattern baldness looks considerably different than it does in men. Rather than the well-known receding hairline that men tend to experience, women usually lose hair across the top and crown of the head in the early stages. This often takes the appearance of a widening part or hair that looks flat, lackluster, or doesn’t hold style as well. 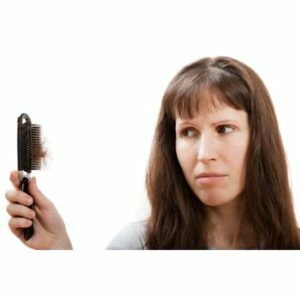 Female pattern baldness can progress over time and cause severe hair loss, but rarely gets to the point of causing total or near total baldness (such as what is seen with men). There is currently only one FDA-approved treatment used to treat hair loss in women; a solution of minoxidil (also known as Rogaine®) applied directly to the scalp to stimulate hair growth. A study published in Recent Patents on Inflammation & Allergy Drug Discovery observes that topical minoxidil can irritate the skin and cause allergic contact dermatitis on the scalp. When considering the potential side effects of the pharmaceutical options, it’s no wonder people are increasingly turning to natural answers for hair loss. Which natural solutions work best for me? It depends on what you suspect is the cause of your hair loss. If you suspect that stress plays a role in your hair loss, consider taking on a relaxing hobby. Habitual relaxing activities, like yoga or simple meditation, can help clear the mind and reduce stress-related hair loss. But be aware that this must be habitual to ensure that you continue to avoid the hair-loss causing stressors. It is also helpful to be in tune with your body and learn to recognize stressors so they can be dealt with promptly as they arise. The Mayo Clinic notes that stress and hair loss can be related, but it fortunately isn’t usually permanent. Whether the stress-related hair loss is caused by literally pulling one’s own hair out or stress simply pushing hair follicles into a sustained resting phase, it recommends getting stress levels under control to give yourself a good chance for the hair to grow back. Additionally, certain vitamins and minerals may help ease and support your body’s ability to naturally deal with stress. B vitamins along with many others are important for the nervous system by supporting mood, memory, and promoting the production of neurotransmitters. If you find yourself dealing with high levels of stress, consider the high quality and comprehensive blend of vitamins, essential nutrients and herbs called Executive Stress Formula that is manufactured by Douglas Laboratories. For those who have been told that hormones (specifically testosterone and the DHT that it can create) may be to blame for hair loss, supplementing with saw palmetto is potentially useful. Saw palmetto has traditionally been used to treat a number of conditions (most notably enlarged prostate), but the evidence supporting its ability to address hair loss caused by androgenic alopecia is quite promising. Although researchers are not entirely sure how it works, it is believed that saw palmetto blocks the conversion of testosterone to DHT. With lower DHT, sensitive hair follicles shrink less. A study published in Research and Reports in Urology found that saw palmetto extract effectively treats hormone-related hair loss in men by inhibiting the enzyme that turns testosterone into DHT. The researchers stated that saw palmetto’s effect was highly comparable to finasteride (commonly referred to as Propecia®). Because saw palmetto affects hormones, and much of the research supporting its use has been conducted on men, women considering this supplement should do so under the direction of a healthcare practitioner. If you are a woman and your doctor suspects that hormones are playing a role in your hair loss, Douglas Laboratories’ Saw Palmetto Max-V is a great way to see what saw palmetto can do for hair growth. Men have found Saw Palmetto Max V safe and effective to use with standardized concentrations of what makes saw palmetto work and a strength that matches the doses used for many of the most well-known hair loss studies for men. Women experiencing hair loss should consult their healthcare practitioner before taking this product. If over-styling sounds like it might be the culprit, start “babying” your hair a little more. Avoid any “tight” hairstyles like pony tails or various types of braiding. Be sure to brush and dry hair gently (without a hot hair dryer) to avoid weakening hair and leaving it more prone to breakage. Also consider changing hairstyles if you find that you often wear your hair in ways that pull on it and cause breakage. If you believe that any medications you are currently on are leading to hair loss, this is a tricky cause to address. Obviously, one can’t just stop taking an important medicine to try and stop hair loss. Ask your doctor if there are any alternative medications or natural alternatives that may work as well. The American Academy of Dermatology notes that inadequate protein intake is one of the leading causes of hair loss. Maintaining sufficient protein levels is important for hair health, as proteins make up hair follicles. Advancing age and chemical-heavy hair products can strip hair of protein over time, and a lack of protein can cause weak, fragile hair. Supplementing with a high quality rice and pea based protein, such as PureLean Protein Blend Basics, is a good choice. PureLean Protein Blend Basics is a great option because it not only contains rice and pea protein but also includes omega-3 and healthy omega-6 fatty acids; which are great for hair health and keeping it looking younger. To read more about which protein is right for you, read my recent article: Which Protein is the Best Fit for You? A study from Dermatology Research and Practice found that women with thinning hair who were given a pill that included biotin (also known as Vitamin B7), twice a day for 90 days, regrew hair and experienced less shedding than those who received a placebo. Biotin improves the infrastructure of important proteins in the hair and biotin deficiencies appear to be harmful to both hair and nail growth. People who are vegetarian or vegan, pregnant, have Crohn’s or Celiac diseases, heavily drink alcohol, or generally have poor nutrition often need more B vitamins, and it may show in their hair. Taking a high quality B vitamin complex can help ensure the body has what it needs to support healthy hair growth. If you think a lack of these nutrients may be the cause of your hair loss, or you are looking to just support the hair that you have, consider adding a supplement like B-Complex by Vital Nutrients. Iron deficiency is one of the most common nutritional deficiencies in the US and women are among those with the greatest risk. Iron is critical for producing the red blood cells that deliver oxygen throughout your body. So without iron, the body goes into survival mode to support vital functions and keeping your hair is not one. A study published in the Croatian journal Acta Dermatovenerologica Croatica found that women with iron deficiency have a high likelihood of suffering from hair loss as well. If you suspect anemia because you are feeling fatigued, pale, short of breath easily, you should contact your doctor and request a ferritin test. For those wishing to up their iron levels, consider Vital Nutrients’ Iron Plus C because it also contains the Vitamin C that is required for the body to absorb iron. New research reveals a potentially strong connection between low levels of omega fatty acids (omega-3s and omega-6s) and hair loss. A study published in March of 2015 in the Journal of Cosmetic Dermatology found that supplementing with omega-3 and healthy omega-6 fatty acids along with an antioxidants boosted hair growth in comparison to the control group. In fact 89.9% of the participants reported a reduction in hair loss, 86% reported an improvement in hair diameter, and 87% noticed an increase in hair density. In this study, the women were all suffering from female pattern hair loss (thinning around the crown and front of the scalp). A recent article about omega-3 and omega-6 fatty acids (How important is fish oil?) discusses the differences and the importance of omega-6s to stimulate skin and hair growth, but also how necessary it is to balance the two. Omega 3 6 9 Emulsion, by BioGenesis, is a quality product that provides a full spectrum of omega fatty acids; including the omega-6 variety that may be lacking in some diets and is missing in many omega supplements. If you have any questions about the products or suggestions discussed here, or need help placing your order, our customer service team is standing by and ready to assist you in any way they can. You can reach them by phone at (888) 460-3091 or you can email them at: customerservice@oakwaynaturals.com. PureLean Basics provides a unique blend of vegetarian proteins, omega-3 fatty acids and superfruit antioxidants in a great-tasting, naturally flavored and sweetened formula. 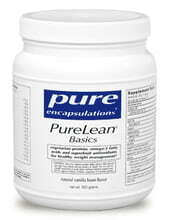 PureLean Basics provides the same PureLean Protein Blend profile, but without the vitamin and mineral core. Have you ever heard someone say that something makes them want to “pull their hair out?” Under extreme stress, as much as 90% of the hair in the growing phase can shift all at once to the shedding phase. About 6 weeks to 3 months after a stressful event is usually when this shedding occurs and it is possible to lose handfuls of hair at once under such a condition. Hair will often grow back as long as severely stressful events can be avoided. But for some women, this is a mysterious chronic disorder that can persist for months without any true understanding of the triggering stressors. The more obvious stressors that affect hair growth are events like child birth, malnutrition, severe infection, or major surgery. There is a substance, called dihydrotestosterone (DHT), which is a root cause (pun intended) of hair loss in both men and women. DHT is a by-product of the hormone testosterone; which is usually abundant in men but also found in women and girls to a lesser degree. With the help of an enzyme found in the hair’s oil glands, testosterone changes to DHT. DHT literally shrinks the hair follicles and makes them finer and finer over time. Teenage girls may experience this kind of hair loss until their hormones balance out. If you suspect that stress plays a role in your hair loss, consider taking on a relaxing hobby. Habitual relaxing activities, like yoga or simple meditation, can help clear the mind and reduce stress-related hair loss. But be aware that this must be habitual to ensure that you continue to avoid the hair-loss causing stressors. If you find yourself dealing with high levels of stress, consider the high quality and comprehensive blend of vitamins, essential nutrients and herbs called Executive Stress Formula that is manufactured by Douglas Laboratories. If you are a woman and your doctor suspects that hormones are playing a role in your hair loss, Douglas Laboratories’ Saw Palmetto Max-V is a great way to see what saw palmetto can do for hair growth. Women experiencing hair loss should consult their healthcare practitioner before taking this product. If over-styling sounds like it might be the culprit, start “babying” your hair a little more. Avoid any “tight” hairstyles like pony tails or various types of braiding. Be sure to brush and dry hair gently (without a hot hair dryer) to avoid weakening hair and leaving it more prone to breakage. One can’t just stop taking an important medicine to try and stop hair loss, so ask your doctor if there are any alternative medications or natural alternatives that may work as well. 1. Boost your protein: The American Academy of Dermatology notes that inadequate protein intake is one of the leading causes of hair loss. Maintaining sufficient protein levels is important for hair health, as proteins make up hair follicles. Supplementing with a high quality rice and pea based protein, such as PureLean Protein Blend Basics, is a good choice. To read more about which protein is right for you, read my recent article: Which Protein is the Best Fit for You? 2. Boost your B vitamins: A study from Dermatology Research and Practice found that women with thinning hair who were given a pill that included biotin (also known as Vitamin B7), twice a day for 90 days, regrew hair and experienced less shedding than those who received a placebo. If you think a lack of these nutrients may be the cause of your hair loss, or you are looking to just support the hair that you have, consider adding a supplement like B-Complex by Vital Nutrients. 3. Boost your iron: Iron deficiency is one of the most common nutritional deficiencies in the US and women are among those with the greatest risk. Without iron, the body goes into survival mode to support vital functions and keeping your hair is not one. For those wishing to up their iron levels, consider Vital Nutrients’ Iron Plus C because it also contains the Vitamin C that is required for the body to absorb iron. 4. Boost your essential fatty acids: A study published in the Journal of Cosmetic Dermatology found that supplementing with omega-3 and healthy omega-6 fatty acids along with an antioxidants boosted hair growth in comparison to the control group. Omega 3 6 9 Emulsion, by BioGenesis, is a quality product that provides a full spectrum of omega fatty acids; including the omega-6 variety that may be lacking in some diets and is missing in many omega supplements. This newsletter should help you find natural products that can help you address your hair loss concerns. If you have any questions regarding the concepts discussed here or anything else, please feel free to fill out our Ask the Doctor form found at the Doctors Corner.